The Good Morning Snore Solution is one of the more popular snoring mouthpieces on the market. It’s clinically proven to work and the company has survived for nearly a decade with thousands of positive reviews. The GMSS is a product that I use personally and is my preferred choice when allergies are not an issue. The GMSS is a Tongue Stabilizing mouthpiece which works by holding the tongue forward using suction. In doing so, it prevents the tongue from falling backward which tends to close off the airway. Read my review of this product for more information. Let’s talk for a minute about how much the GMSS costs. You may be thinking “$100 for a piece of silicone that stops your snoring?” While the idea of spending this amount of money may sound ludicrous, it’s worth it knowing that you are dealing with a reputable company who produces a safe and effective product. The company is registered with the FDA as well as several other agencies around the world that regulate such medical devices. We keep this page updated with the most current Promo codes available. See below for details. GMSS usually offers promotions around holidays such as Christmas and Fathers Day. They will occasionally offer readers of this blog discounts such as Free shipping, BOGO or 50% off. This page will keep up with the latest deal that is available. 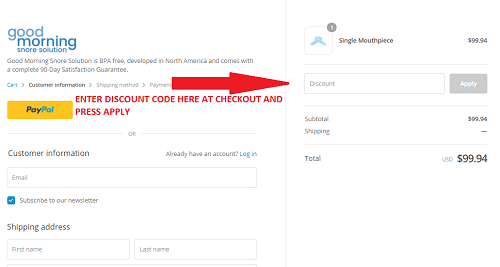 In order to take advantage of this any available discount codes, they must be entered in the discount code section that appears while entering your shipping information. Here’s what the promo code screen looks like.